Yesterday was Day 1 of my March Mitzvah Challenge. So I ask… what is the difference between being kind to someone and/or performing a random act of kindness — and — adhering to common courtesy and/or doing the ‘right’ thing? I think there’s a fine line… but what’s sad, is that I think so many people only think about themselves any more, that even giving someone a courteous gesture is seen as noble. SO… I’m not counting things I should have been doing all along. Like, letting a car go ahead of me, holding the door for someone or saying thank you and please. These are things we ALL should be doing, ALL the time. I tried to smile at as many random people as possible. Most smiled back. I posted about my challenge, encouraging others to join me — which in turn, plays it forward. I gave a handful to change to the Salvation Army can outside my grocery store. You know… the one we all tend to hurry past? I personally thanked the gentleman ringing the bell… for volunteering his time and for doing a great job. I took the time to help out my bro-in-law’s girlfriend by completing an online survey she has for her current field study. I cooked dinner for a dear friend! So… to bring the focus back to food for a minute, tonight’s dinner was an easy-to-prepare, affordable, healthy meal — made solely with Trader Joe’s products (can I count the product plug as a random act of kindness too???). 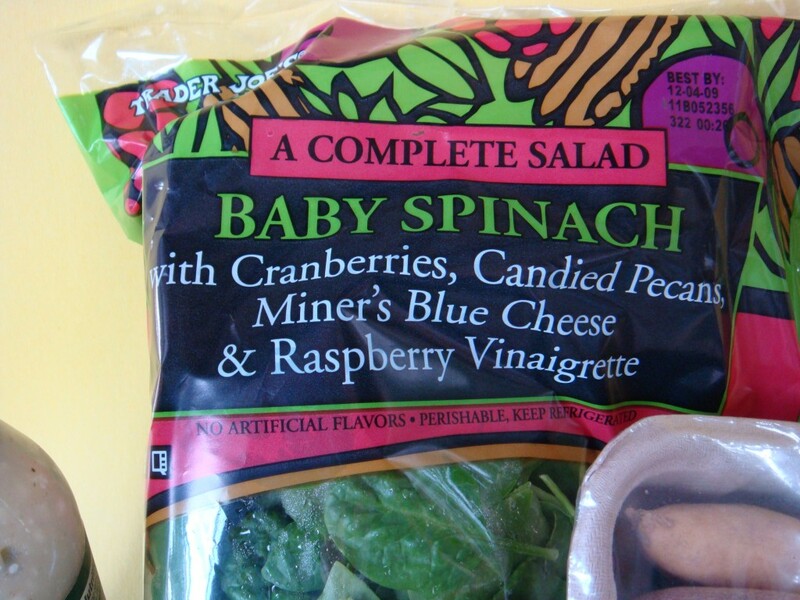 The spinach salad came first and was obviously the easiest of all. TJ’s packages the items all together… the spinach is loose in the bag and then there is a separate package that contains little bags of the cranberries, nuts, blue cheese and dressing. As mentioned above, chose not to go with the raspberry vinaigrette that came with the salad. 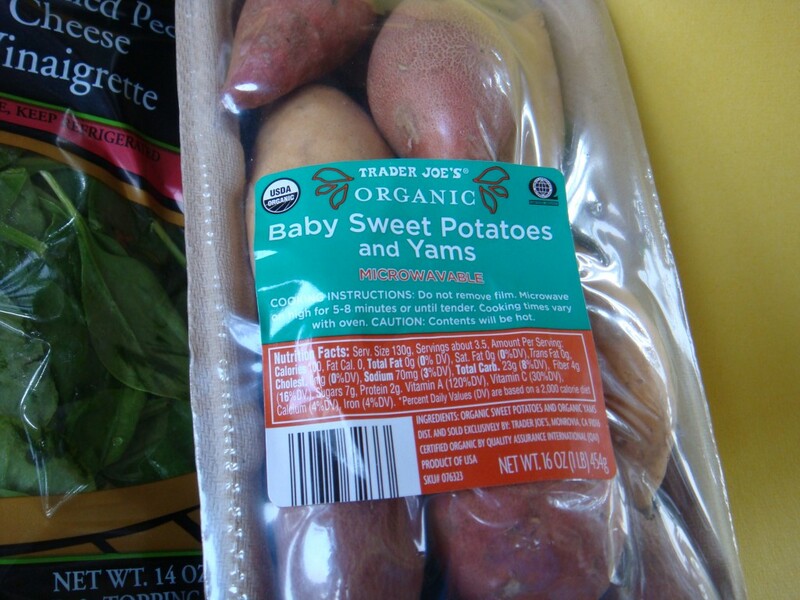 I added too many calories and grams of fat to the dish, so I purchase another Trader Joe’s product to try out. 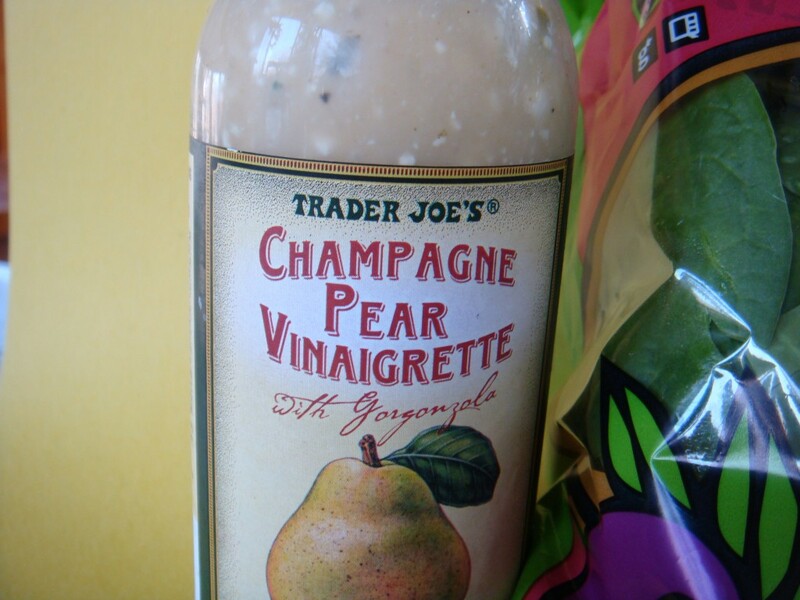 The Champagne Pear Vinaigrette with Gorgonzola. I’ve been eyeing this dressing for years… wanting to try it. It’s located in the refridgerator section, and since we almost always dress our salad with olive oil and balsamic, I’m usually hesitate to buy dressings that exprire quickly. So what was the verdict? The salad was great… the ingredients were fresh, the Miners blue cheese was tangy and added a nice dimension to the salad and the candied pecans were wonderful. That said, I wasn’t a huge fan of the dressing. It was good, don’t get me wrong… a bit too tangy or something. Not sure. I need to try it again on a plain salad so I can taste it by itself. The final peice of the dinner was the Haricot Verts and the Tilapia. 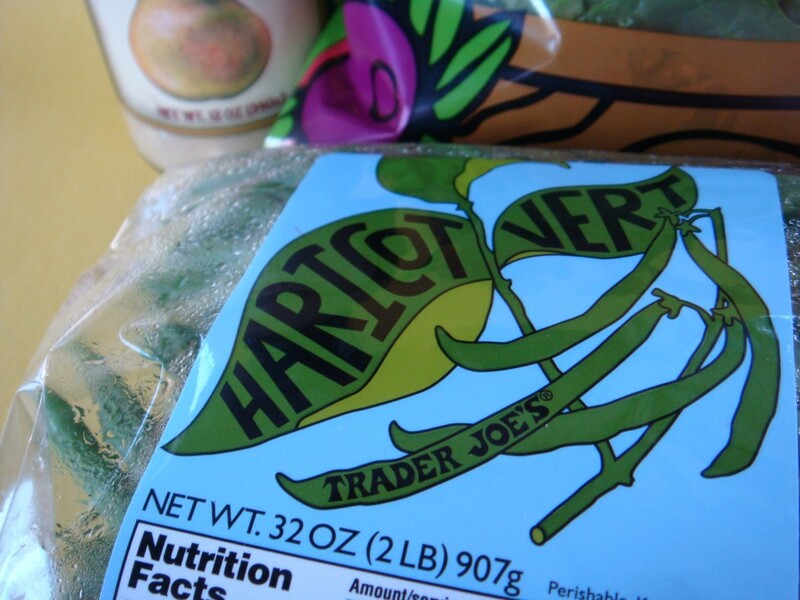 Trader Joe’s doesn’t always have these Haricot Verts… the seem to be seasonal. This is just a partial package, we had eaten most of them already… as the package was JAMMED with beans (2lbs worth). More than enough for seveal meals. For both the beans and the fish, I just steame them together in my steamer pan. Unfortunately, the beans got a little more ‘done’ than I like — while I waiting for the fish to cook through. They were still really good though. I just toss them with a little olive oil, sea salt and fresh ground pepper. The fish took about 8 minutes to cook if I remember correctly. Steaming the fish preserved all the juices and added more. Before I give you my opinion on the fish, let me first say that I am ridiculouslypicky with fish. I get weirded out at even the slightest smell or taste of funkiness. I love sushi… sushi doens’t have any odor or fishy taste whatsoever… so what that tells me is that any fish that does obviously isn’t that fresh. To begin with, I thought the fish smelled a little ‘fishy’ — but the seasoning smelled good and the entire thing starting smelling really good as it was cooking. Once done, I tasted a little piece of the edge of the filet and didn’t love it. My friend tasted it and said it was great… so this could be just me. 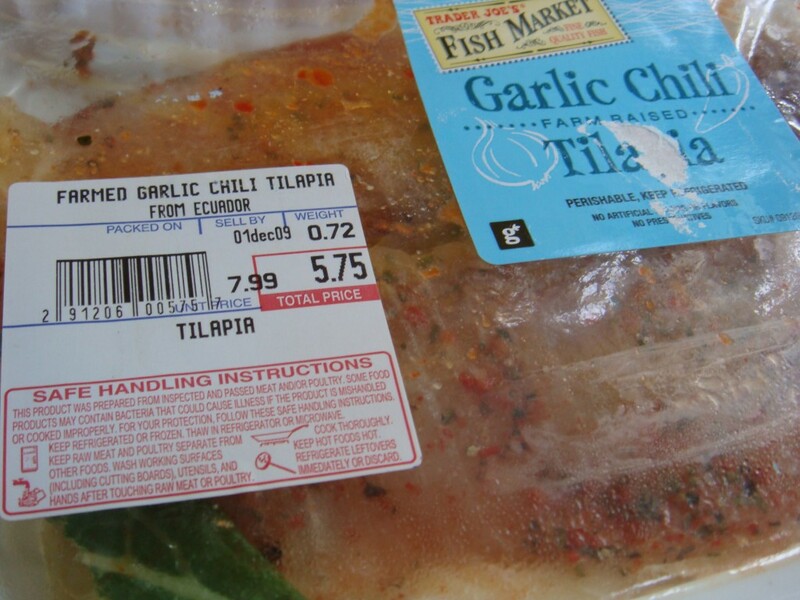 I thought the texture was weird (maybe like it had been frozen and thawed), but that could also be Tilapia in general — I don’t eat it often enough to know. The flavor of the seasoning was pretty good — but a tiny bit bland. My friend couldn’t get enough of the fish… I coudln’t choke all mine down. So the verdict is out. Since the husband has eaten this product in the past and also loved it… I have to assume that it’s good and that it’s just my neurosis that prevented me from enjoying it. All-in-all a pretty good first day of Mitzvah. What will today hold? I don’t have any ‘acts of kindness’ planned… so I guess I will have to seek them out!